School is a stone’s throw away and I’ve been sitting with a pen and paper writing down healthy, delicious snack ideas for the kids lunches. No Mom wants to entirely rely on sugary pre-packaged lunch snacks for the kids but it can be a challenge to find healthy alternatives. This weekend I am baking some amazing brownie treats which I bake with veggies hidden inside them and I am also hitting the grocery store to pick up Summer Fresh‘s Snack’n Go and Hummus Mini 4-Packs. My girls are dip-lovers, they really enjoy grazing over a dip with either flatbreads, crackers or veggies so these Snack’n Go Hummus Minis are an easy choice for their school lunches. There are 3 flavours to choose from; Original, Roasted Garlic and Roasted Red Pepper. Each of these includes a convenient mini container of delicious dip and pack of flatbreads. This is one school snack I know they won’t be moaning about, it can be frustrating for them to have these healthy lifestyle changes but in this case they LOVE the hummus and I LOVE the fact they’re eating healthy while I’m not with them! 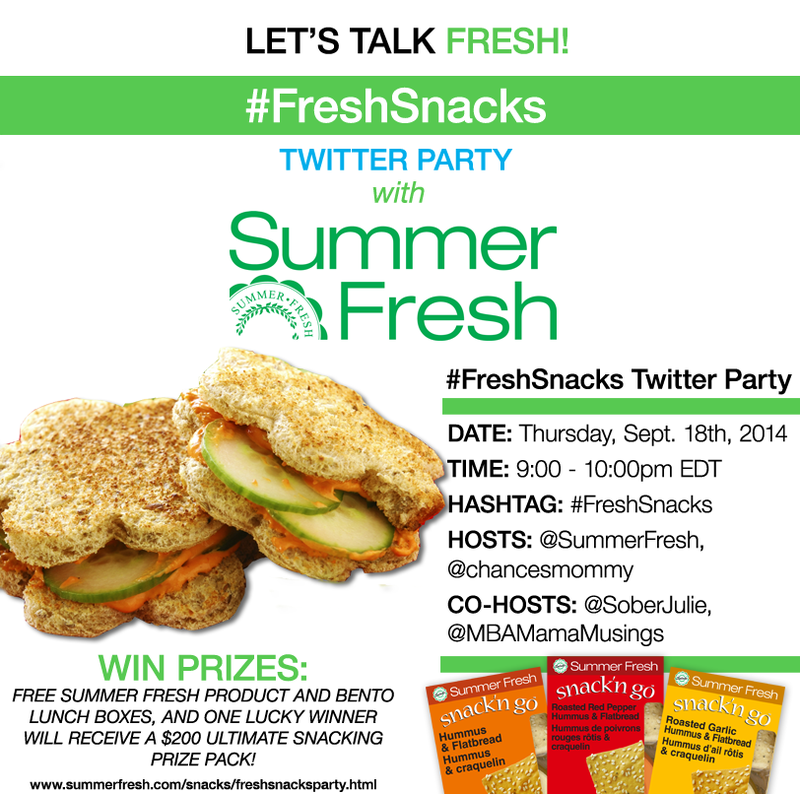 The fine folks at Summer Fresh know that parents have healthy school snacks on the brain and want to encourage us all to share our ideas at the #FreshSnacks Twitter Party! Eligibility: Open Worldwide, only residents of Canada eligible to win prizes. Make sure to RSVP to be eligble to win one of the amazing Summer Fresh prizes! PRIZES : 7 $25 Fresh Prize Packs of a Fresh Bento Box for lunch on-the-go, and coupons for free Summer Fresh product, and for the $200 Ulimate Snacking grand prize! (Product will vary depending upon availability in the winner’s region. Twitter party is open to all Worldwide, but only residents of Canada are eligible to win prizes. ).